Ray-Ban has long been a trusted name in the fashion world and it comes as no surprise: their iconic designs have been featured in countless films and television shows, and are often seen on the runway. 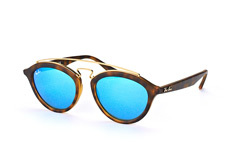 The Ray-Ban Gatsby line is certainly no exception. Their sleek, sophisticated design combines vintage elements with a chic, modern twist. If you are looking for a pair of sunglasses that are timeless yet on-trend, cool yet elegant, look no further than Gatsby frames from Ray-Ban. The Ray-Ban brand has long been one of the most popular in sunglasses, ever since Ray-Ban brought their legendary Aviator sunglasses to the market in 1938. Inspired by the iconic style of “The Great Gatsby”, Ray-Ban’s Gatsby model effortlessly combines retro style with a modern chic touch. The Ray-Ban Gatsby is available as a unisex model with round lenses and a double bridge (RB 4256), as well as in a smaller version with a slightly flatter browline (RB 4257). Both models come in a variety of colours and can be fitted with different types of lenses. Find a colour scheme that best suits your personal taste, be it classic black with grey lenses or something more edgy with coloured, mirrored lenses. 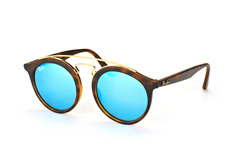 What’s more, both Gatsby models can be fitted with prescription lenses. Shopping online can be tricky for some, but we at Mister Spex have taken the guesswork out of buying sunglasses online. Thanks to our virtual fitting tool, you can instantly see exactly what you will look like sporting a new pair of Ray-Ban Gatsby sunglasses. All you need to do is upload a photo and align the sunglasses to your face on the screen to see what you will look like with a new pair of Gatsby sunglasses. Try on as many different colours as you like, it only takes a few clicks of your mouse. Once you have chosen which model and colour you would like your new Ray-Ban Gatsby sunglasses to be, it only takes a few minutes to complete your order. We offer free delivery on all orders over £29.00 and always send our products by traceable delivery. Should you be unhappy with your new Ray-Ban Gatsby sunglasses and wish to return them, simply send them back within 30 days for a full refund. 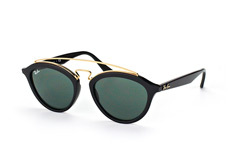 Find your new pair of Ray-Ban Gatsby sunglasses online at Mister Spex today!